Do you find yourself stumbling on opening your favorite bottle of wine? Has removing the cork of your favorite wine bottle become a tiring task? VinOrama's hand crafted premium corkscrew is your solution!! The best rated corkscrew that opens every wine bottle effortlessly. 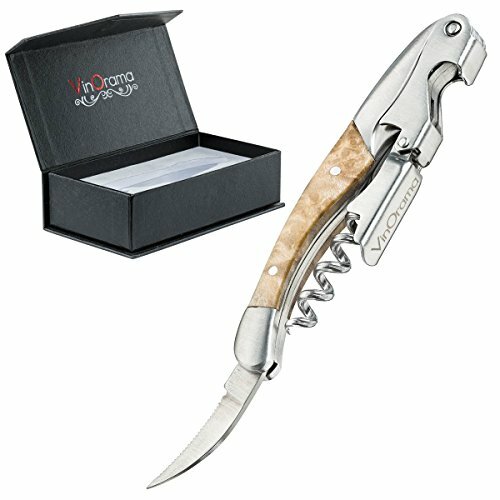 ★ TOP QUALITY CRAFTSMANSHIP - Our 3 in 1 multi-task tool elegantly combines a sturdy wine corkscrew, beer bottle opener and foil cutter. ★ ZERO CHANCE of CORK CRUMBLING - Thanks to our precision-cut notch along the worm that grips the cork securely and reduces the drag as it effortlessly cuts through the cork. ★ SMOOTHEST PULL - Of even the longest cork due to the double hinge fulcrum. ★ HAND MADE - From the very first step of the process to the very end. A true master-piece that is sure to enhance every wine setting. ★ NATURAL ROSEWOOD HANDLE - Unlike others, each handle boasts its unique wood grain for that authentic rich look. ★ CAPTIVATING GIFT PACKAGING - This all-in-one corkscrew with its elegant gift packaging is something every wine enthusiast loves to give and love to get. Looking for that perfect gift for someone special? Vinorama's waiters rosewood corkscrew boasts a unique, enchanting gift packaging that is sure to delight your loved one. With its stark black box and bold logo displayed, this corkscrew surely sets wine standards to greater heights. ★ BONUS - Included is a cool black velvet carry pouch, Extremely portable and geared for travel. ★ BUY WITH CONFIDENCE - VinOrama personally guarantees their Waiters Corkscrew will last a lifetime! So order now with a complete peace of mind. Click ''add to cart'' now and Order yours today. PROFESSIONAL CORKSCREW USED BY WAITERS, SOMMELIER AND BARTENDERS AROUND THE GLOBE! VinOrama's superior, hand crafted waiters corkscrew wine opener is designed to satisfy the wine lover's desire for a top-notch wine bottle opener. The handle is made of the finest quality, hand-picked durable rosewood, and unlike others, each of our corkscrews rosewood handle owns its unique figure. SPECIALLY DESIGNED WORM is constructed of strong polished steel and is guaranteed to neatly remove any natural or synthetic cork effortlessly! The precision-cut notch along the worm grips the cork firmly and also reduces the drag as it cuts through the cork, making it less likely the cork will disintegrate. DOUBLE-HINGED FULCRUM makes opening wine bottles twice as easy by providing extra leverage and a smoother pull of even the longest corks! the two piece hinge offers a significant powered advantage over the older style single hinge corkscrew, by creating a nice 2-part cork removal. LONG, ROUNDED AND SERRATED FOIL CUTTER makes foil removal quick and mess-free. Works better than other brands with our longer and sharper foil cutter, It is also exclusively designed to minimize any ripping of the foil or plastic. and eliminates the need to purchase another gadget. PRESENTABLE GIFT PACKAGING includes captivating matte gift box and elegant black velvet carry pouch. Extremely portable and geared for travel. Elegant design features the company's logo imprinted on the double-hinge and an attractive design engraved on the sturdy frame. This corkscrew is sure to be something you'd love to give-and love to get!! Our wine opener is guaranteed-LIFETIME. So order now with complete confidence and peace of mind. We know you'll be coming back for more!